Skegness Town Reserves will play Spilsby Town in the final of the Sharman Burgess Sports Cup Final. Spilsby Town were taken to extra time by Friskney, eventually winning the game 4-3 after it finished 2-2 in the 90 minutes. Friskney’s goals came from Victor Sibert, with a penalty, and Greg Brown, who scored twice. Skegness Town beat Nothgate Olympic by a single goal in hard-fought match, the winning goal coming from Daniel Aston. Benington were the big winners in the Workforce Unlimited Premier Division as they beat Swineshead Institute 3-1, which places Swineshead firmly at the bottom of the table. Pointon helped themselves to three points by beating Railway Athletic 2-0, Sam Elliot and Ian Jacquest scoring the goals. Wyberton Reserves rounded off the season away at Coningsby, but found themselves loosing the game 5-1. Shaun Boothby (two), Lee Gemmell, Dan Nixon and Ben Brown were the machwinners. Wyberton’s goal came from Will Nuttell. Fishtoft became the Division One champions after they beat Old Doningtonians 6-2, rivals Boston College and Woodhall Spa United drawing 1-1. Billinghay Athletic had a excellent home win against Fosdyke, winning the game 4-1. Freiston slipped into the bottom two, losing away at FC Hammers. 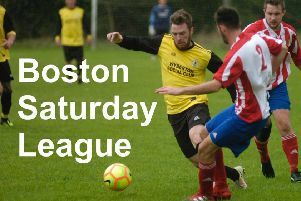 In Division Two, Spalding Harriers finished their season with a 3-3 draw against JFC Boston Seniors. Harriers’s goals came from Stefan Belakov, Patryk Kopacz and Daniel Goddard.